There are no less than 25 beautiful Saint Martin villa rentals with late availability and SPECIAL OFFERS for the Winter Season 2014. There may never be a better time to escape the cold to the warmth of the Caribbean island of Saint Martin! Additionally a number of St. Martin vacation rentals are already offering discounts for the coming Summer Season. For stays between 1st February and 15th April 2014 get the 7TH NIGHT FREE at all of the following St. Martin villa rentals. Belle Fontaine; the open design of this sprawling hillside Saint Martin villa rental blurs the line between inside and outside. The views of the ocean and Saba from Belle Fontaine are simply beautiful. The huge wooden deck and unique swimming pool with its built-in table make it an ideal holiday villa for an active group of friends or an extended family. Recently renovated and redecorated with the addition of a fifth bedroom and a very large gazebo. Can be rented as a 3, 4 or 5 bedroom St. Martin villa rental. Find out more about Belle Fontaine, Baie Longue, Terres Basses, Saint Martin. Encore is without any doubt an outstanding hill side villa overlooking Baie aux Prunes (Plum Bay) on the island of Saint Martin. The tasteful decoration, very spacious and equal size bedrooms, vast heated swimming pool, and lovely outdoor areas are just some of the features in this fully air-conditioned St. Marting villa rental. Encore villa provides absolute tranquility and magnificent views in late afternoon hours making this gorgeous, spacious and beautifully decorated house an extremely attractive choice for anyone seeking serenity in a contemporary yet classic family home while on vacation in St. Martin. Can be rented as a 4 or 5 Bedroom villa! Find out more about Encore, Baie aux Prunes (Plum Bay), Terres-Basses, St. Martin. Fields of Ambrosia, Terres Basses, Saint Martin, has just been completely refurnished with high quality furniture from Tommy Bahama. The layout of this charming St. Martin holiday villa provides maximum privacy for each of the three bedrooms, and outstanding views from all parts of the house. From its hillside perch, you have spectacular views of Simpson Bay, Marigot and the ocean. Fields of Ambrosia can be rented as a 1, 2 or 3 bedroom Saint Martin villa rental. Find out more about Fields of Ambrosia, Anse aux Cajoux, Terres-Basses, St. Martin. Hacienda villa has a fantastic island style design with beautiful contemporary furnishing. The combination of splendid sunset views on the west coast of Saint Martin and lush landscaping gives a new perspective to tropical beauty. This splendid new St Martin villa rental also features 2 interior connecting rooms and a playground for children. Can be rented as a 2 or 3+1 bedroom villa. Find out more about Hacienda, Baie Longue, Terres Basses, Saint Martin. Interlude, Baie Rouge Beach, Saint Martin. In a serene beach front atmosphere, this spacious, fully air conditioned and contemporary top quality holiday villa is warmly and elegantly decorated with wooden floors throughout (Oak inside - Teak Outside). With a large plasma TV in the living-room and all 5 bedrooms, and a well-appointed kitchen featuring a custom designed oven and state of the art equipment, this Saint Martin villa rental is the perfect paradise for a dream vacation. Find out more about Interlude, Baie Rouge Beach, Terres-Basses, St. Martin. Find out more about Jacaranda, Baie Longue, Terres Basses, Saint Martin. This superb hillside Saint Martin villa rental consists of a living room, kitchen, three bedrooms with private baths, and an attached guest house with another living room, a large bedroom with walk-in closets and a private bath . La Croisette features a gorgeous view of Baie Longue, Saint Martin, and a large pool-side terrace with two gazebos, one for dining and one for lounging. La Croisette is ideal for a group of good friends or a family with children. Can be rented as a 2, 3 or 4 bedroom St. Martin vacation villa. Find out more about La Croisette, Baie Longue, Terres Basses, Saint Martin. Featured in the November 2012 issue of Coastal Living magazine as one of the 20 best villas in the Caribbean, Le Mas Caraibes is a beautiful, comfortable home with many unique elements including a stunning 20’ x 40’ pool constructed from natural Indonesian river pebbles giving you the illusion of swimming in a tropical stream. Wide tropical verandahs and porches provide ample outdoor living and dining spaces as well as private sitting areas for each bedroom. Find out more about Le Mas Caraibes, Anse au Cajoux, Terres Basses, Saint Martin. Le Mas des Sables is a superb oceanfront three bedroom villa rental located on the cliffside of Baie aux Cayes in Terres Basses with spectacular views of the ocean and the Saint Martin coastline. The layout of this charming Saint Martin villa rental provides maximum privacy for each of the three bedrooms, and beautiful views from all parts of the house. Surrounded by lush tropical gardens, Le Mas des Sables offers a secluded hideaway for nature lovers. Located less than 1 minute drive from Baie Rouge Beach and walking distance to the snorkeling site "Trou David". Find out more about Le Mas des Sables, Baie aux Cayes, Terres Basses, Saint Martin. Les Quatre Saisons is a very charming Saint Martin villa rental, which has been completely refurnished recently. Tastefully decorated, the comfortable indoor living/dining area opens onto the terrace and the large outdoor living/dining area. From its hillside location overlooking La Samana Hotel, you can enjoy a breathtaking view of Baie Longue (Long Bay) and beautiful Caribbean sunsets. This spacious and light-filled St. Martin holiday villa features tile floors and graceful verandah surrounding the pool. The four bedrooms tastefully redecorated offer now king size bed. Les Quatre Saisons can be rented as a 2 or 3+1 bedroom Saint Martin villa rental. Find out more about Les Quatre Saisons, Baie Longue, Terres Basses, Saint Martin. L’Olivier, named for the olive trees that line the long winding driveway to the villa from the private entry gate, sits on a commanding position offering over 230 degree views from the island of Anguilla, across Plum Bay Beach, all the way to the middle of Long Bay Beach. From any vantage point along the lengthy sea-facing deck you feel like you’re on top of the world. This beautiful Saint Martin villa rental has 5 bedrooms and 5 bathrooms and can be rented as a 2, 3, 4 or 5 (4+1) bedroom villa. Find out more about L’Olivier, Baie aux Prunes / Baie Rouge, Terres-Basses, Saint Martin. 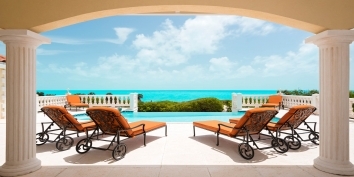 Lotus is a magnificent, brand new, Saint Martin villa rental. Open and fully air conditioned, spacious floor plan, state of art kitchen, large pool and outside deck with large sitting areas around the pool and under a very large Indonesian style gazebo, overlooking Long Bay (Baie Longue), St. Martin. Three equal bedrooms tastefully decorated with luxurious bathrooms en suite. Beautiful vistas of the Caribbean Sea from a location, very near Bay Longue beach, Saint Martin. This St. Martin vacation villa can be rented as a 1, 2 or 3 bedroom villa. Find out more about Lotus, Baie Longue, Terres Basses, Saint Martin. Maison de Rêve is a one of a kind a « Dream house » that has become a new jewel in the exclusive Baie Rouge section of Terres-Basses on the Caribbean island of Saint Martin. This elegant and private, state of the art, 8000 square foot vacation villa is fully air conditioned and features six bedrooms and six bathrooms. Maison de Rêve is ideal for a family or corporate retreat, as well as an intimate getaway. Beautiful views of the Caribbean Sea, Anguilla, St Martin mountains, Simpson Bay and Marigot, with pounding surf on the reefs insure magical views day and night from the expansive multilevel decks throughout the property. Find out more about Maison de Reve, Baie Rouge, Terres-Basses, Saint Martin. This unique 5 bedroom villa situated on the "Falaise des Oiseaux" overlooking Baie Rouge, Saint Martin and the island of Anguilla, offers one of the most stunning views you can find anywhere in the world. Marine Terrace holiday villa was renovated and completely refurnished in 2008. Built on 2 levels, this St. Martin vacation villa has a large pool located at the entrance leading to the main reception living area. Three large bedrooms are situated on the main floor and open to the living area. The two remaining bedrooms are on the lower level offering a lot of privacy and beautiful views over the ocean. 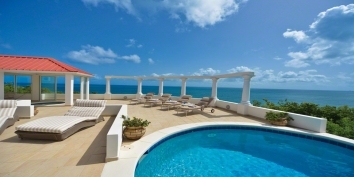 Marine Terrace can be rented as a 3 or 5 bedroom Saint Martin villa rental. Find out more about Marine Terrace, Baie Rouge, Terres-Basses, Saint Martin. Terres Basses is home to Mariposa, a superb, private Saint Martin villa rental with 180º views of the crystal blue waters of the Caribbean Sea and the setting sun. The spacious indoor and outdoor living areas offer ideal opportunities for relaxing and entertaining while on vacation in Saint Martin. Complete with the gourmet kitchen and covered outdoor dining area with gas BBQ. Find out more about Mariposa, Baie aux Prunes, Terres Basses, Saint Martin. Located on the French side of Saint Martin in the exclusive area of Terres Basses (The Lowlands), Mille Fleurs is a spacious 4 bedroom colonial-style villa set on two-and-a-half secluded acres of lushly landscaped grounds. Perched above the tranquil waters of Plum Bay (Baie aux Prunes), Mille Fleurs offers breathtaking panoramas of the Caribbean Sea, the Atlantic Ocean and the islands of Saba and Anguilla. When the sun sets, enjoy cocktails around the pool and marvel at the Caribbean night sky revealing a symphony of stars. As a romantic setting, Mille Fleurs is unsurpassed -- Serenity and privacy beckon those seeking a luxury retreat -- the perfect setting for a romantic vacation. Find out more about Mille Fleurs, Baie aux Prunes (Plum Bay), Terres-Basses, St. Martin. This gorgeous Saint Martin villa rental is very sophisticated and elegant. You can enjoy beautiful sunset views over the Caribbean Sea, La Samanna Hotel and Long Bay Beach from its unique outdoor entertainment area. Mer Soleil villa features include a fully equipped gazebo kitchen and huge flat screen TV in the air conditioned living room. Mer Soleil can be rented as a 3, 4 or 5 bedroom Saint Martin holiday villa. Find out more about Mer Soleil, Baie Longue, Terres Basses, Saint Martin. Situated on a dramatic cliff site, Pointe des Fleurs, Saint Martin, features a private stairway to a secluded sandy beach. You will adore the panoramic views of the Caribbean Sea and Baie Rouge Beach from the gazebo, swimming pool deck and glassed-in living areas. Pointe des Fleurs holiday villa has 4 bedrooms and 4 bathrooms. Completely refurnished in 2009! Find out more about Pointe des Fleurs, Baie Rouge, Terres-Basses, Saint Martin. Sol é Luna is a very well appointed Saint Martin villa rental. Fully air conditioned with all three bedrooms accessible from the inside. This St. Martin vacation home offers Plasma TVs and DVDs in the living room and each of the bedrooms, marble bathrooms en suite and a gourmet kitchen. This St Martin holiday villa has views over Simpson Bay Lagoon and the Ocean. Sol e Luna villa has enlarged its swimming pool and its deck which give providing extra space for your Saint Martin vacation. Find out more about Sol e Luna, Simpson Bay Lagoon, Terres-Basses, Saint Martin. For stays between 1st April and 14th April 2014 you SAVE 20% off the high season rates and between 1st June and 30th June 2014 you SAVE 15% off the low season rates at all of the following St. Martin holiday villa. Located in the deed community of Terres Basses (Low Lands), Saint Martin, L’Agora is a modern and spacious villa overlooking the Caribbean Sea. This brand new St. Martin villa rental was tastefully designed by our architects to offer a calm and unique environment. The holiday villa is nestled on the hillside of the French territory in a secluded area, surrounded by trees and bushes in order to provide complete privacy. This incredible Saint Martin villa has a spectacular terrace with a full sized pool and several lounge chairs. For warmer days, there is a covered gazebo, perfect for relaxing or sipping on a refreshing cocktail while on vacation in St. Martin. The outdoor living space also includes a BBQ grill to prepare delicious meals. Find out more about Agora, Baie Rouge, Terres Basses, St. Martin. Located in the deed community of Terres Basses (Low Lands), La Bali is a spacious and elegant three-bedroom Saint Martin villa rental overlooking the Caribbean Sea. This new holiday villa, tastefully designed and decorated by our architects, is nestled into the hillside of the French side of Saint Martin in a secluded area, the trees and bushes surrounding the villa guaranteeing complete privacy for your vacation. Find out more about Bali, Baie aux Prunes, Terres Basses, Saint Martin. A brand new villa designed by architects in a perfect mix of modern and Caribbean style, La Coral is located in the deed community of Terres Basses (Low Land), on the French side of the island of Saint Martin. This luxurious St. Martin villa rental overlooks the Caribbean Sea and offers gorgeous sunset views. The gated property is surrounded by trees ensuring complete privacy to our guests. Find out more about Coral, Baie Rouge, Terres Basses, St. Martin. Located in the deed community of Terres Basses (Low Lands), Saint Martin, Kiwi is a spacious and elegant three-bedroom villa overlooking the Caribbean Sea. This new St. Martin villa rental, tastefully designed and decorated by our architects, is nestled into the hillside of the French side of St. Martin, two minutes away from Long Bay (Baie Longue) or Plum Bay (Baie aux Prunes) beaches. Find out more about Kiwi, Long Bay, Terres Basses, Saint Martin. La Magnolia is a gated property located within the community of Terres Basses, Saint Martin, lying on the ridge of a gentle hill, surrounded by tropical gardens and allowing spectacular views south west over the Caribbean Sea and the Island of Saba. Long Bay Beach, one of the finest white sand beaches of the island, is a stone throw away, as is La Samanna Resort famous for regularly hosting international celebrities that share the same beautiful beach of Long Bay or "Baie Longue". The outdoor living space at La Magnolia includes a large sunny deck with lounge chairs, a covered terrace equipped with a bar and refrigerator, a dining area for 6 guests with a gas BBQ grill, as well as a lounge/seating area. The property enjoys excellent privacy for your Saint Martin vacation with no neighbor to overlook the premises. Find out more about La Magnolia, Baie Longue, Terres Basses, Saint Martin. Villa La Pergola is a classic French West Indies villa with a great relaxing ambiance provided by its luxurious Mediterranean style and the unforgettable view of Long Bay in the upscale community of Terres Basses, Saint Martin. This well designed, huge, four bedroom vacation villa is set within well manicured gardens and features an extensive outdoor area comprising a terrace with shaded seating, a sun deck, large BBQ Gazebo and an infinity-edge private swimming pool that cascades down to a Spa-style pool end. Find out more about La Pergola, Long Bay (Baie Longue), Terres Basses, Saint Martin. NOTE: these rates and special offers are subject to availability and change at any time without notice. Please see the full details in each villa listing for the full terms and conditions.